SFFD Cost to Air Meetings From City Hall? My schedule didn't allow me to attend the December 16 meeting of the San Francisco fire commission and participate in the discussion about finally televising their meetings on SFGov TV. Thanks to commission secretary Maureen Conefrey, who has shared the transcript of this item along with the PowerPoint slides used by SFGov TV technician Jack Chin, I learned much info. 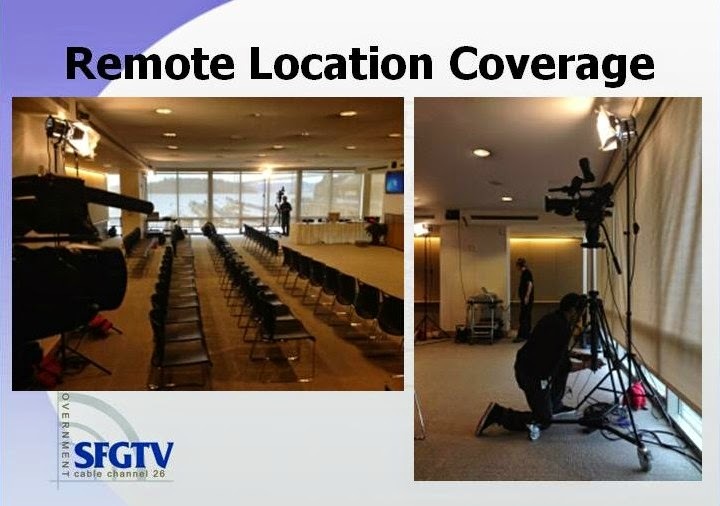 First, the price-tag for simply moving the fire commission meetings from their not-so-easy to get to location at the department's headquarters on Second Street near Townsend to City Hall and one of the many hearing room tech-ready for broadcasting is about $33,000 annually. If the commission opts to keep meeting at headquarters, the annual cost is just over $49,000. This option is more convenient for fire department brass than taxpayers and the transcript shows commissioner Michael Hardeman toeing the SFFD party line. Hardeman claims that 25 or 30 SFFD folks would have the burden of traveling from headquarters and finding parking at City Hall. He's not the least bit concerned with making the meetings more accessible for the general public at a much more convenient location, especially for those of us dependent upon on Muni to get to meetings. On the other hand, commissioner Frances Covington urged her colleagues to consider the challenges for many ordinary folks to get to the current meeting location and does not want the City Hall option ruled out. I hope her voice will prevail when a final decision is made about from where to broadcast the meetings. I again laud commissioner Ken Cleaveland for his push in the past few months to have these meetings on SFGov TV and his comments at the December 16 meeting. 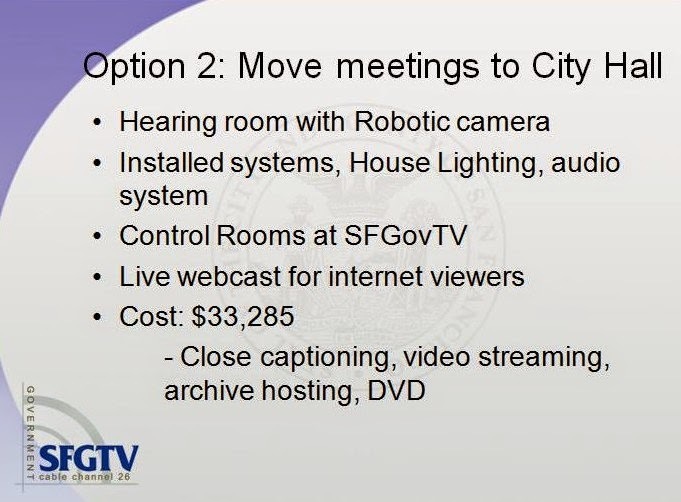 SFGov TV's Chin also said airings from City Hall could begin in one month, versus four-to-six months before they could start televising from SFFD headquarters. So, we can have fire commission meetings begin sooner, at a lower cost to taxpayer and in a more accessible location at City Hall, or the commissioners and brass can remain where they are for meetings and run up a larger bill in a location difficult to access via public transportation. Good to know it's really a matter of when not if the fire commission meetings with be broadcast on TV and available on the web. That alone is a giant step forward and all this is happening without a single member of the Board of Supervisors paying attention to expanding government transparency, never mind using their soap boxes to bring the SFFD into the tech and TV age. Let's lobby the commissioners to go with the City Hall option.